Justin Ling, the bitter little shithead at Vice who got mad at me a long time ago – I criticized him for thinking that the torture and murder of Luka Magnotta’s victim was funny, and he never forgot it – is still mad at me. This upsets me a great deal, as you can well imagine. Sorry, Justin. As a public service, then, I offer the following links about the place where he worked for so long (and, I stress, there are some good folks there – including a couple who have told me Justin was a workplace monster, and who have taken concrete and positive steps to clean the place up in the new era). It’s revealing and informative about the Ling era. Here’s the National Post’s exemplary work – and Spin, and Billboard’s follow-ups – on how a boss at Vice Canada actually recruited young women (and men) there to work as drug mules. They’re now in prison, but the former Vice boss isn’t. Here’s a Variety story about how two of the most senior guys there have been suspended for sexual harassment and sexual assault. Over and over. For years. This little guy who was at Vice apparently thinks #MeToo – and guys like me, I guess, who support it – are a joke. Except we’re not the joke, Justin. You are, for working alongside a gang of pigs and criminals for years, and saying precious little. And still taking their paycheques. What person in his/her right mind would sign that? … people who are young, intimidated, broke, and desperate for work, and have no idea what they are getting in to. I can’t say that a younger, naiver me wouldn’t have signed that. I’m just glad Rogers is pulling all funding from the terrible Viceland TV channel and it’s going off the air at the end of March. 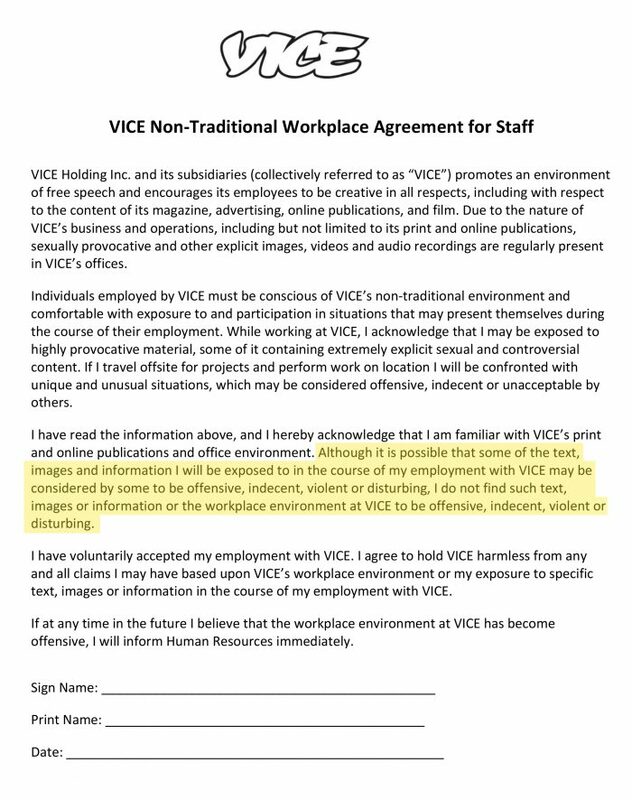 Isn’t Vice the publication that couldn’t have a alcohol at their Christmas party because they were worried that some of their employees would get too drunk and harass other employees? Or was that Buzzfeed?